I’m a little unadventurous these days when making Turkey. I guess I’ve made so many over the years that it seems like I’ve tried it all. I’ve had fried turkeys and turkeys with all kinds of herbs and spices and turkey with citrus; you name it, I’ve probably tried it. I’ve cooked turkeys spatchcocked and upside down and just about every way you can think of. And after all that, I just went back to my basic brined turkey (I’ll post that sometime) and not much has tempted me away from those classic flavors and simple method…until now. I was actually googling for the brine I always use (I do have to post that recipe sometime if nothing else so I have it!) when I came across this recipe from Bon Appetit that dry brines the turkey. “Hey, that sounds much easier than trying to fit my big old turkey in brine in the fridge,” I thought. And so I tried it. And fell in love with the method. I also love that Almost Bon Appetit’s Dry Rubbed Turkey seems a little less salty than my wet brined turkey and the resulting gravy and turkey broth (I use this recipe for my turkey stock, Best Turkey Broth or Chicken Broth) were less salty, too. That’s always a bonus! I found out when caring for the folks that the feasting along with a lot more salt than usual can mean a trip to the emergency room. So think of your elderly relatives when preparing your holiday dinners. What I didn’t care for on this turkey was the glaze; some did from the reviews, but I made it, tasted it and it left me cold. I did an about face and remembered my Honey Roast Chicken…and how good it was basted with honey and tarragon, and in a nod to Bon Appetit, I altered the recipe and used honey, butter, tarragon, and a touch of soy for color. The flavors are amazing, it’s very classic and while the idea of honey might make you think “sweet” it really isn’t! Honey is hygroscopic and I’m no scientist, but I think as mixes with the salt and natural juices, it forms this crispy almost a bit chewy skin that is just about addictive. Make sure to use kosher salt; I missed it at first and was ready to go with table salt when I decided to check “Diamond Crystal” and found out it was a kosher salt; I haven’t ever used Diamond Crystal. So I had to check the handy-dandy Conversion Chart from Morton’s. I love that chart and use it all the time. Sprinkle your dry brine mixture on your turkey like you’d sprinkle seasoning on your steak. I had to brush off almost all my salt mixture (see photo) after I was finally able to locate this video from Bon Appetit (it was on their site but wasn’t working, although it is now) and I was able to see how much of the salt mixture to use. There was so much more salt than needed for the turkey; I cut it back in my recipe. I brined my turkey for two days since the directions said 12 hours to two days and more is always better, right? lol! The turkey looked a little shriveled and had lost some moisture, but the skin was “glued” to the turkey. I literally could not get the butter underneath the skin. Since I had set out the full four tablespoons and then got the turkey and used my fingers to grab the butter, I had to toss the rest of the butter. I was only able to coat the turkey, which took probably about a tablespoon and a half of the butter. It still turned out incredibly moist. Almost Bon Appetit’s Dry Rubbed Turkey – way too much salt! I had to brush most of it off. The directions for timing and testing are a bit vague. 30 minutes at high temperature (450 degrees F.) then 65 to 85 minutes at the low temperature (300 degrees F) for the exact size turkey, 12 -14 pounds, or until a thermometer in the breast reads 150 degrees F.
I doubted that and cooked my turkey to 160 degrees F. and the breast meat climbed to a safe temperature (165 degrees F.) when resting. For some reason, I just figured I was home free since I had already cooked the turkey 10 degrees higher than called for and didn’t check anywhere else. I don’t know what I was thinking. The breast was perfect but the rest of the turkey was pretty raw. Which is a good reminder to me to not toss out safe cooking and testing methods even if the recipe comes from a reliable source like Bon Appetit and Andy Baraghani is cute as a bug’s ear! And I wasn’t the only one with issues from the comments. Just out of the oven, this shows the set up for the turkey with rack, shallow pan and aluminum foil. The turkey hardly gave off any juices. I removed the breast and tossed the rest of the turkey back in the oven. Actually, I may have left the dark meat in a little bit too long for that second cook! But we primarily like the white meat, anyway, which was gorgeous and juicy. Maybe that’s the key to great turkey…others that reviewed the recipe did that and a few others removed the breast and put the rest of the turkey in broth to finish cooking. Make sure to follow standard procedure and check your turkey in the three places recommended by our governing food agencies like the USDA (although they err a bit on the side of safety. Most salmonella is killed when the temperature reaches 160 degrees F. for at least one minute). Test at the innermost part of the thigh (that’s the key test area) and the innermost portion of the wing and thickest part of the breast. If it’s at 160 the turkey will continue to climb to 165 degrees F. with the residual (or carryover) heat. Next time I’ll cook the 30 minutes at high heat and then cook at 325 degrees F. instead of the 300 degrees in the original recipe. It’s nice to know at least about when to expect that turkey to be ready, especially if your turkey is a different size than called for in the recipe. Turkeys that are brined cook up a bit differently than others, and this particular turkey has a head start because of the initial high roasting at 450 degrees, so be sure to check early. At 325 degrees, the rule of thumb is about 15 minutes per pound and at At 350 degrees, plan on 13 minutes per pound. I’m a little divided when it comes to buying turkey. I’d rather buy a fresh one, but usually can’t afford it, to put it bluntly. My second choice is a cheap frozen one, a turkey that’s minimally processed. Once you get into the medium price range you’re talking about turkeys that might have been prebrined, basted with oil, injected with water, etc. I’d rather be in charge of what’s added to my turkey. Shop early in the sales cycle or what might be left is going to be either giant birds or very small ones. Personally, I don’t mind a larger turkey because I have a ton of ideas for what to do with the leftovers. See my post on 12 Days of Turkey. If you can catch the butcher at your store or whoever is in charge of the meat department, ask when the next shipment is coming in so you can be prepared to get to the store shortly after if you want a more reasonable size. This recipe didn’t come with a gravy, but indicates to save the neck for making gravy. That’s because after brining there will be very few drippings to work with. See the photo of my pan, above. Place salt and brown sugar in a medium bowl and work together with your fingers until incorporated. 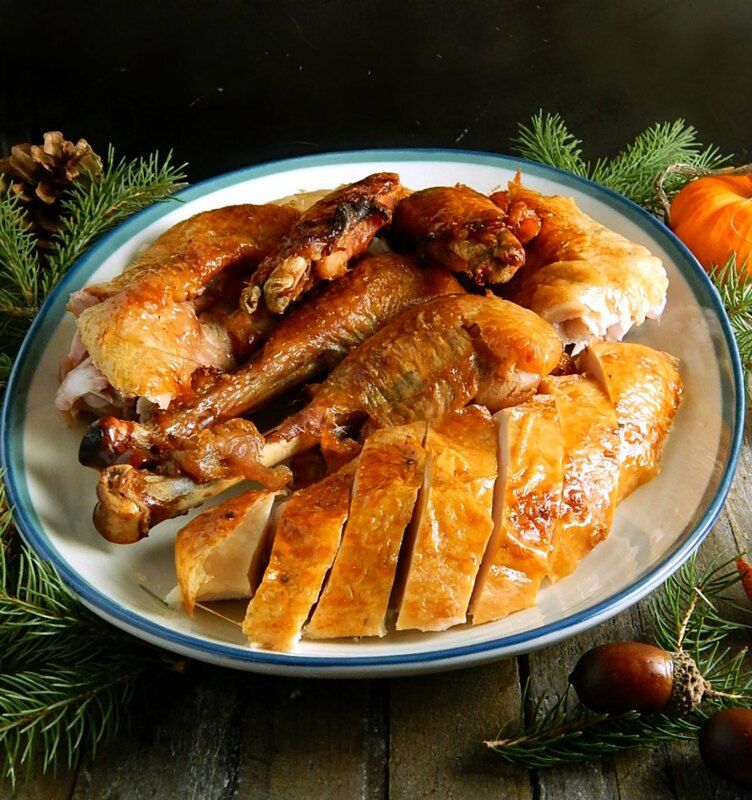 Place turkey on a wire rack set inside a rimmed baking sheet. (If you don’t have this setup, place your turkey on a V-shape rack set inside a large roasting pan.) Sprinkle dry brine all over outside and inside of the turkey, patting to adhere and nudging some into crevices. You won’t need all of the dry brine, but it’s good to have extra since some of it will end up on the baking sheet as you season the turkey. Chill bird, uncovered, at least 12 hours and up to 2 days. Place an oven rack in the middle of oven; preheat to 450 degrees F.
Remove turkey from wire rack and rinse baking sheet and rack if needed (turkey will most likely have released some liquid onto pan). Line baking sheet with a layer of heavy-duty foil and set rack back inside. Place turkey, breast side up, on rack and tuck wings underneath. Using your fingers, loosen skin on the breast. Work four tablespoons butter under the skin, spreading evenly over both breasts. Smear outside of turkey with another 1 1/2 to 2 tablespoons butter. (see note at bottom of recipe) Tie legs together with kitchen twine. Place turkey in oven and pour 1 cup water into baking sheet. Roast turkey for about 30 minutes, rotating pan halfway through, until skin is mostly golden brown all over. Turkey is done when a thermometer inserted into at the innermost part of the thigh (that’s the key test area) and the innermost portion of the wing, as well as thickest part of the breast, registers 160 degrees F. The temperature will continue to climb while the bird rests.) Skin should be deep golden brown, shiny, and crisp. Transfer turkey to a cutting board and let rest, if you can wait, at least 30 minutes and up to 1 hour before carving. Heat honey and two tablespoons butter, add tarragon and soy and place on top of the stove to keep warm. After brining for two days, the skin had adhered to the turkey and I was unable to get any butter underneath. It took about 1 1/2 tablespoons of butter to coat my turkey. Cover the turkey breast with foil if it becomes too dark towards the end of cooking time. I’ll be posting Bon Appetit’s Dry Rubbed Turkey at Fiesta Friday #253, co-hosted this week by Liz @ Spades, Spatulas, and Spoons and Mila @ Milkandbun. This entry was posted in Click here for Bargain Meals, Click here for Fabulous Food Posts and tagged Bon Appetit, Brine, Turkey. Bookmark the permalink. I kind of feel the same way! After a turkey I think I won’t want one for ages but everytime I see the pic of this one I want it again! I’ll take the thigh & leg part!!! It certainly is not too late Mollie. I have brined (wet) and dry brined my turkey in the past. I think the dry brine was the preferred method although now I highly recommend sous vide. When roasting in the oven the dark and white meat are never done at the same time. Although a whole roasted turkey is gorgeous, I think roasting them separately is the only way to ensure both are delicious. Thank you for sharing on FF. I love your honesty in reading your post and the good tips. Hi Liz, I think you’re right about that! Thanks for hosting for us at Fiesta Friday! Thanks Mila, and thanks for hosting for us! This turkey looks perfect for the holidays! I like the glaze too. Happy Christmas Mollie! Delicious looking roasted turkey. The skin looks glorious. I wonder how it would work with just the 2 breasts. I usually break down my whole turkey after thawing it and get creative with the different types of meat. I have yet to buy kosher salt … regular and sea salt are all I have in the house. The skin is the best part. I do a glaze like that for the roast chicken and it works well so I think it would be fine with the breasts. You might need to turn the heat up towards the end or maybe the broiler on low for a few to make sure it gets crispy..